Artificial skin sprayed directly on the body. The term is probably a contraction of artificial derma. Over her lacerated right shoulder he sprayed art-derm; it sealed off the open wound, halted bleeding, and prohibited infection. The most serious damage was to her windpipe. He turned the little art-derm nozzle on an exposed section of rib, wondering what the shupos had that worked so well. It had carved her open expertly, whatever it was. One of the earlier uses of this idea was created several years ago; Dr. Fiona Wood and scientist Marie Stoner of Perth, Australia. 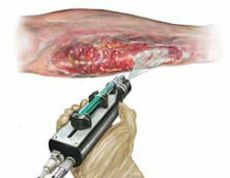 In response to trying to treat a patient with burns over 90% of her body, the pair created a procedure to spray skin cells directly onto the body. The Armed Forces Institute for Regenerative Medicine has been working on a skin cell gun to spray healing stem cells onto an open wound. 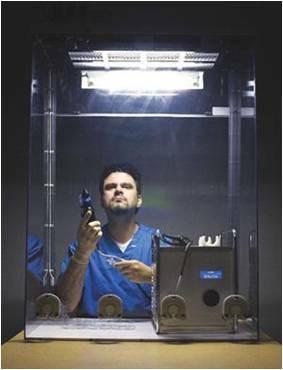 The skin cell gun was announced by Dr. Gerlach in 2008 — it sprays cells onto burned areas in a fine mist which expedites healing and reduces scaring is shown below with a photograph of Dr. Gerlach holding the device. 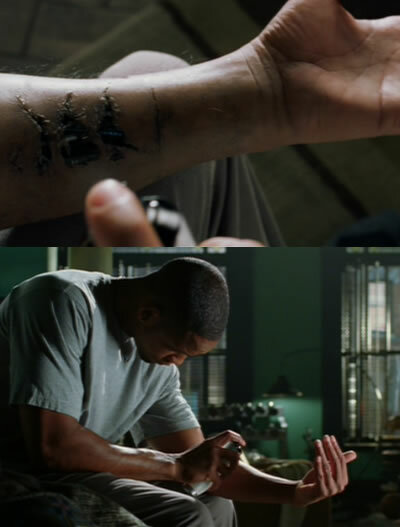 SF fans probably also recall the artificial skin gun demonstrated in the 2004 movie I, Robot (although it's not clear if this gun sprayed paint or living tissue). Also, see an earlier reference to this idea from Robert Heinlein's 1951 novel The Puppet Masters - surrogate skin.